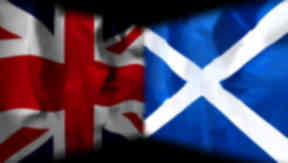 An Ipsos MORI survey found 35% of voters back independence while 55% want to remain in the union. Voters are turning away from the "absurdities" of the SNP case for independence, according to Scottish Labour leader Johann Lamont. Her comments came as a poll suggested support for Scottish separation has dropped since a survey in January. About 35% of people who are certain to vote backed independence, down four points since the previous poll. Opposition has increased by five points to 55% at the same time, the poll by Ipsos MORI suggested. More than 1000 people were asked if they agree Scotland should be an independent country, the SNP's preferred question for the ballot in late 2014. Among all voters, including those who were not sure if they would vote or not, 32% agreed with Scottish independence and 55% disagreed. Ms Lamont said: "This shows that the more people hear the arguments, the more they see through the absurdities of Alex Salmond's case for separation and the more they recognise the benefits of Scotland's partnership in the UK. "This debate can reinforce Scotland's place in the UK and let us get away from this constitutional bickering and concentrate on the real issue - how we improve life for each and every Scot." Scottish Conservative chief whip John Lamont said the poll confirms people do not want to see Scotland "divorced" from the rest of the UK. "It is no surprise that since the celebrity-driven launch of the yes campaign, the desire for separation has faded," he said. "It is clear to this majority that Scotland is far better off being part of the most successful social and economic union in the world." But Nationalists argued the new poll compares favourably to one commissioned by former Labour chancellor Alistair Darling on the eve of the Yes Scotland launch. His poll showed 33% for independence while opposition was at 57%. SNP campaign director Angus Robertson said: "Things are moving in the right direction and we are very confident of achieving a Yes vote for an independent Scotland in the autumn 2014 referendum. "We believe that the positive case for an independent Scotland will overcome the negativity of the Tory-led anti-independence campaign." The poll also ranked party leaders by popularity, scoring them on the difference between those who think they are doing a good job or performing badly. First Minister Alex Salmond's approval rating fell by nine percentage points but still remains in front with a net "satisfaction" rating of 13%. Scottish Green co-leader Patrick Harvie followed on 12% and Labour's Ms Lamont scored 9%. Conservative and Liberal Democrat leaders fared worse, with Prime Minister David Cameron scoring the lowest at -46%. Scottish Conservative leader Ruth Davidson scored -7% while Lib Dem leader Willie Rennie recorded -4%.